All of the stops were pulled out with the new REV'IT! 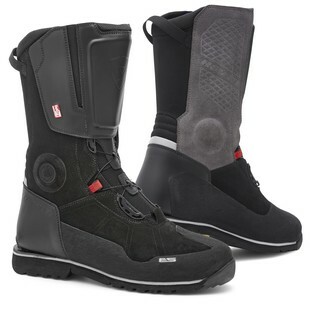 Discovery Outdry Boots. They also brought some big names to the party in terms of comfort, protection and quality. The chassis of these boots is comprised of reinforced suede leather, full grain leather and 500D Cordura. This is topped off by REV’IT!’s in-house laminated waterproof breathable membrane. All this quality protection is held on your foot and ankle by a BOA closure system. The BOA system is top tech used in everything from climbing shoes to medical braces. The next big name is the Virbram sole that provides grip and feedback on the pegs, on the pavement or on the walk down the trail to glimpse a waterfall. The REV'IT! Discovery Outdry Boots offer a super premium boot for the commuter, adventurer, weekend warrior or astute leaf-peeper.